The 2020 Earth Pathways Calendar will be available for purchase from early in July 2019. Make a note to come back then and order your copy of this beautiful calendar! 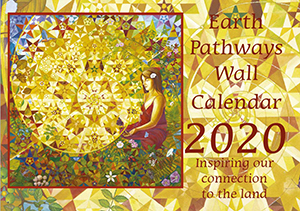 The 2020 Earth Pathways Calendar is a full colour, month at a view wall calendar. It includes astro data for the UK's full and new moons, and follows the seasonal cycle of the Earth festivals. It is A4 in size, opening up to A3 when hanging on the wall. It is wrapped in a fully biodegradable poly bag which can go in your compost bin once you have opened it up!